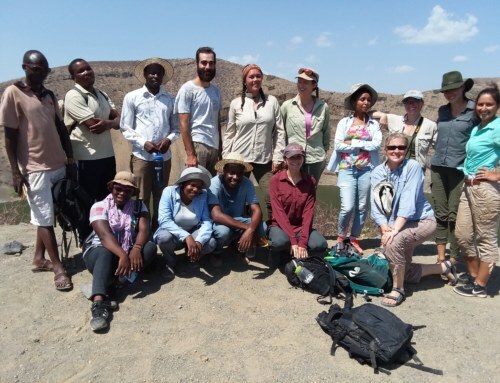 Because of the successful end of our last excursion in the field, we returned to the same site to try to find other remnants of this ancient primate. 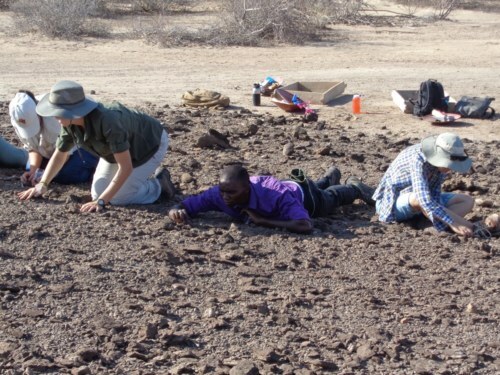 When we got back, we did a hill crawl to cover the area below the find, with the thought that over time the fossil skeleton may have gotten separated in the surrounding area. 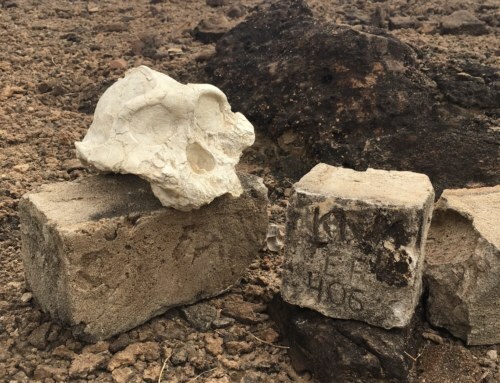 While we were conducting the hill crawl, Dr. Skinner noticed in an adjacent area that a few other primate fragments had been marked and recorded, including a femoral head, a proximal humerus, and part of a mandible. After discussing with Apolo and Sale, we determined that previous fieldwork must have uncovered these fossils. This knowledge was very exciting as we realized that what we had found and were hoping to find could contribute to this previous fieldwork! Dr. Skinner explains the area that we will be crawling over. Dr. Skinner proudly watches as the students begin the hill crawl. Tobias has gotten comfortable as he sifts through every rock in his section. 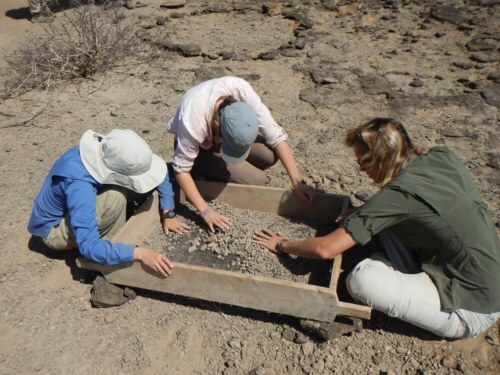 Esther and Millie comb the ground for tiny fossil fragments. Sale helps Max identify a fossil fragment. Following the hill crawl, we planned to thoroughly sieve the site. 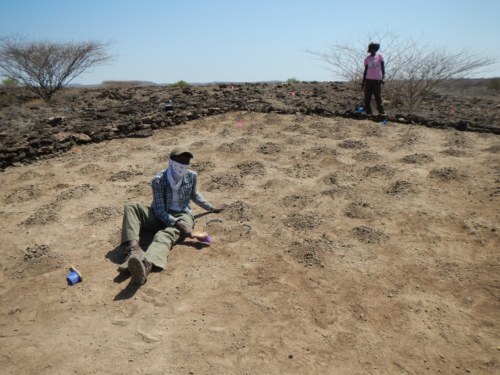 We first had to define our sieve area, which we did by clearing the space of all large rocks and using them to mark the boundaries of our section. 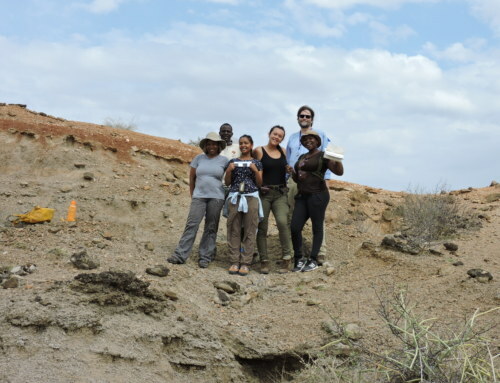 The students, now experts at all types of field work, largely led the investigation, with everyone helping and alternating roles. 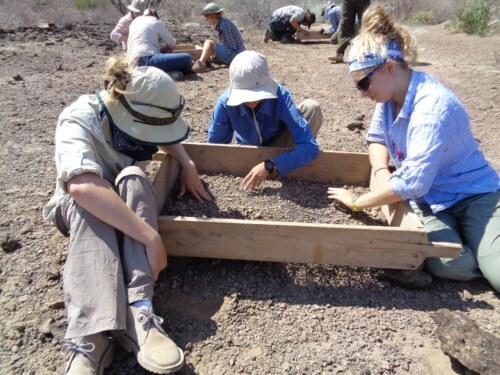 The students clear the area and load sediment onto the karais for seiving. 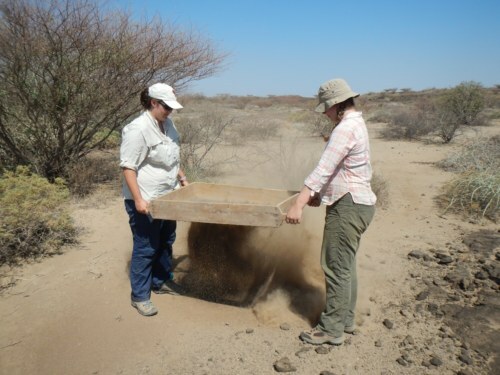 Millie and Sale load sediment onto karais. Notice the stark contrast inside and outside the sieve area. 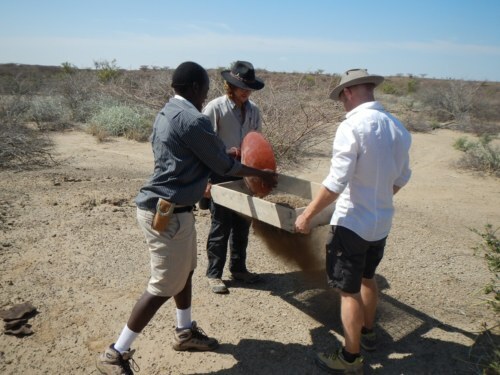 Apolo dumps sediment into the sieve that Jon and Dr. Skinner are holding. Then, Jon and Dr. Skinner carefully sort through the remaining sediments, hoping to find small fossil fragments. Natalie, Carla, and Kathryn search through this sieve. Danielle, Millie, and Carla painstakingly comb through the contents spread out before them. Yvette and Morgan shake the dust and dirt out of this batch. Sale pours the contents of this karai into Emily and Yvette’s sieve; more than half of this will be shaken out! 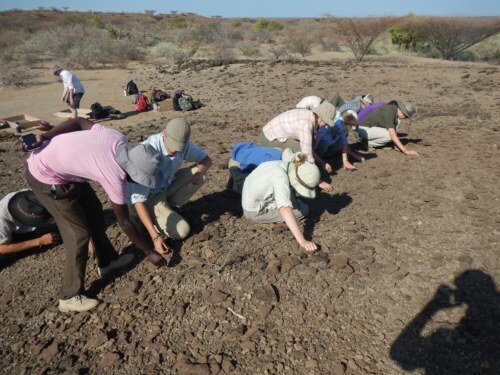 The students crowd around the sieves in groups of three, quickly and efficiently turning over every small rock as they search for fossil fragments! 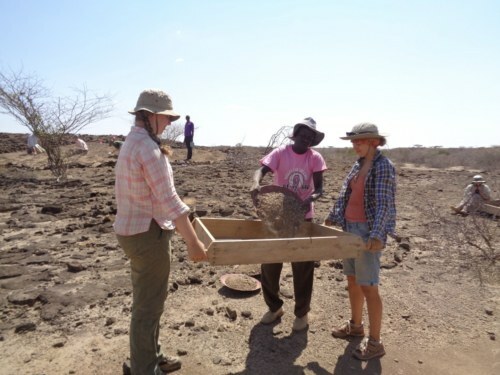 Esther proudly poses with the sediment piles, each of which will fill a karai! She wears a bandanna over her nose and mouth to keep out the dust. 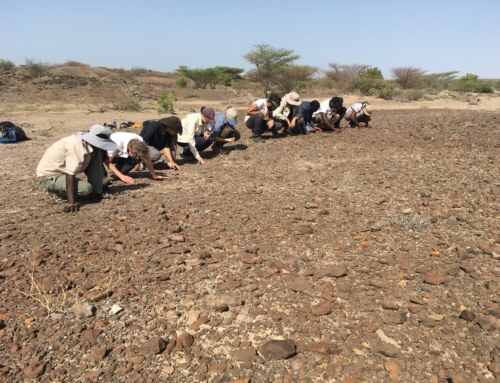 Unfortunately, we were not able to sieve through all the material, but left with the knowledge that the hominin hunters would be returning the following day to finish the job. 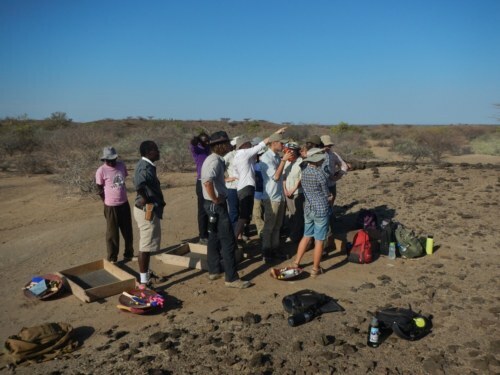 Though it was comforting to know this site wouldn’t be left unsieved, it also made us realize that this was our last excursion with the TBI-Ileret hominin hunters! We are eternally grateful for their assistance and kindness over the past seven weeks, and could not have asked for better friends from whom to learn these important skills. 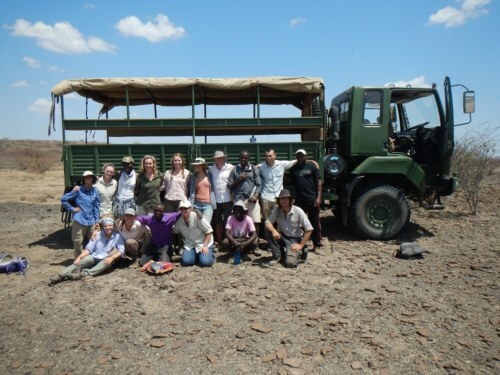 A final group picture with Apolo, Sale, Mwan’gombe, and the trusty lorry! 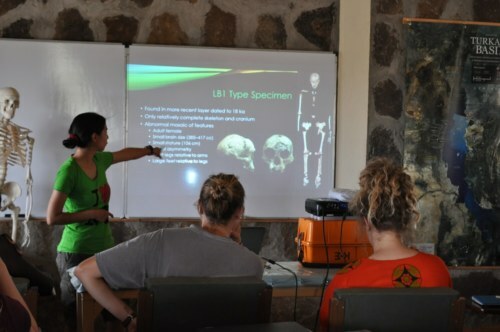 The final project for the Human Evolution module was an in-class presentation. 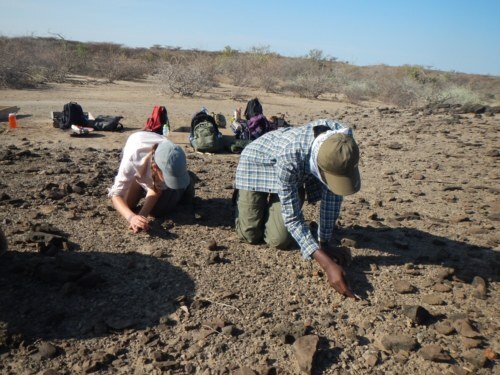 This assignment allowed the students to engage in a range of topics, and critically think and analyse a few of the complicated intricacies in the field of human evolution. Below are pictures from several of the presentations! Esther discusses the earliest evidence for fire. Millie presents on Neanderthal plant use. 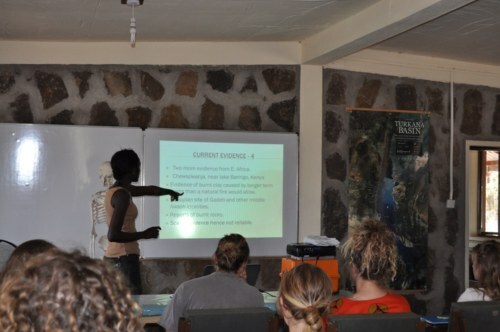 Carla explains a few of the pathologies that may have afflicted the type specimen of Homo floresiensis. 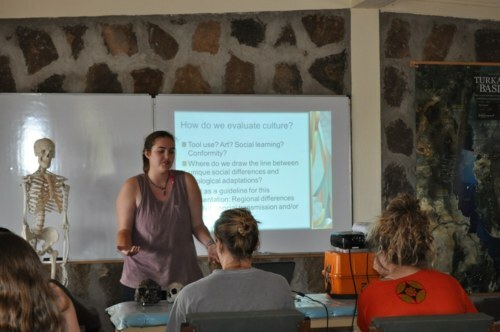 Morgan poses the question “how do we evaluate culture?” to the class. 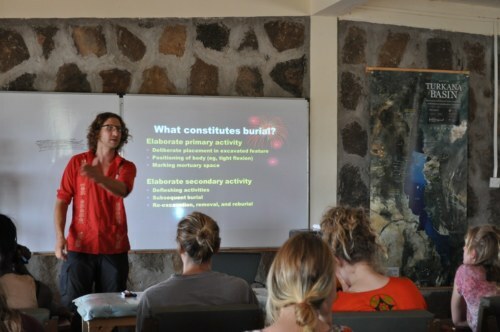 Likewise, Jon asks the class their opinions on how burials should be defined. 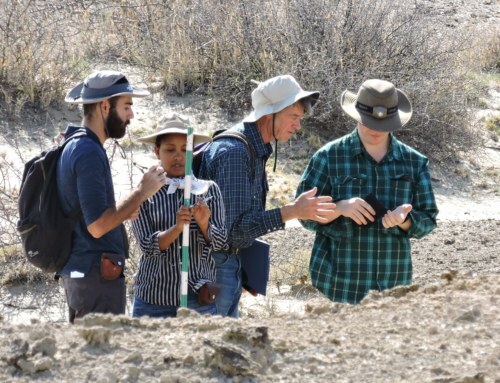 Dr. Matt Skinner cannot be thanked enough for his knowledge and expertise as he guided us, cast by cast, through the evolutionary lineages of early hominins to what makes us modern humans. To thank him for his help, the students made him a card and a “brow ridge,” a humorous reference to one of his lectures. Dr. Matt Skinner with his card and brow ridge! 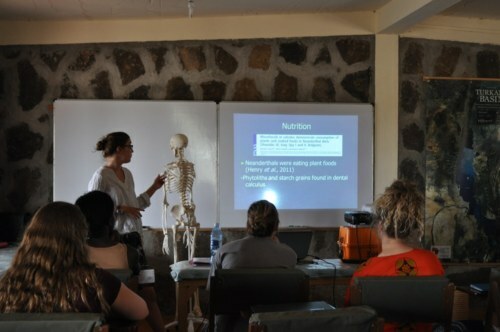 Unfortunately, the end of the Human Evolution module also marked the end of our stay at TBI-Ileret. 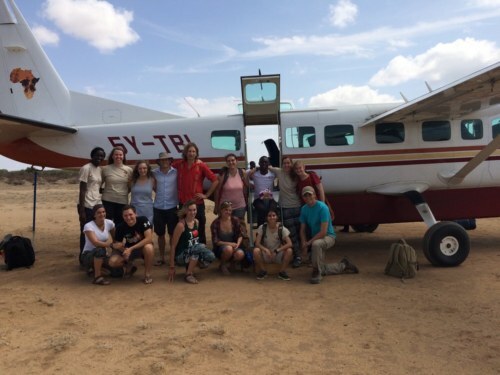 We would be traveling by plane across Lake Turkana to the TBI-Turkwel campus for the Archaeology module. 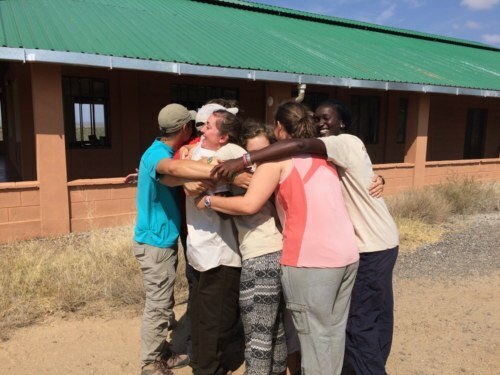 The students give Mwan’gombe a big group hug as he offers them words of hope and encouragement! 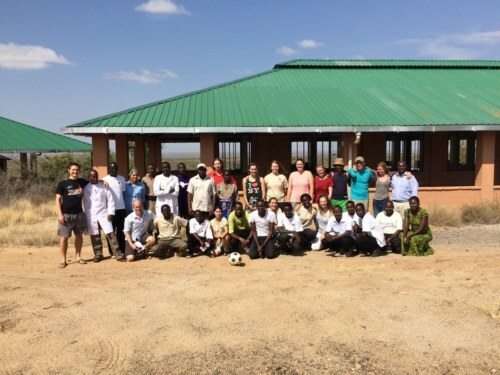 The students and TBI-Ileret staff; a fond farewell to our dear friends! 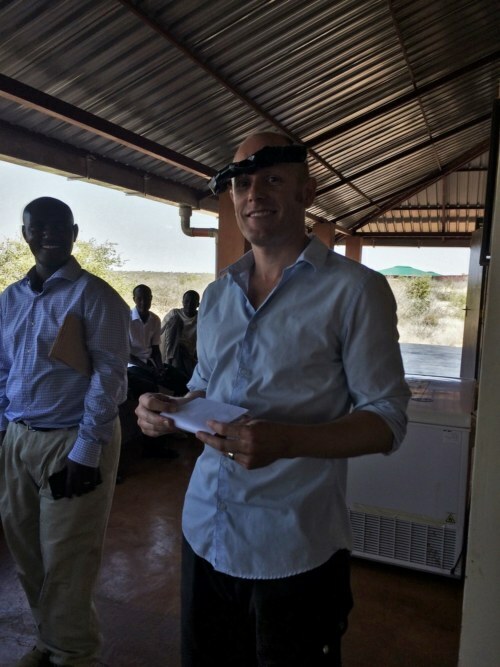 A final goodbye to Dr. Matt Skinner. Asante sana and safari salama! It is difficult to express the range of emotions we all experienced. The staff not only made our stay here possible, but through their hospitality and kindness, made us feel truly at home. As a result, fast friendships were formed, and students and staff alike found it hard to believe that our time here was up. With heavy hearts and no small amount of tears, we said goodbye (for now!) to our new friends!